Greetings from south of the border! Today I’m going to attempt the impossible–a semi-comprehensive article summing up the Mexican salsa experience. It’s tough because the subject is pretty broad, there being an ideal sauce for virtually every dish in every region of Mexican cooking. Salsas, moles, pipianes and adobos are the highest, most indisputable privilege of this vibrant, resonant, complex and amazingly varied World Heritage cuisine. Salsas have always held an important place on the Mexican table by ancient prehispanic custom. A diner may preview coming attractions by scooping up a bit of raw or cooked salsa with a warm tortilla, crisp tortilla chip or piece of bread as a simple appetizer, and salsas will enhance and adorn antojitos, rice dishes, soups, salads and cooked dishes, adding rich dimensions of flavor, texture and heat. In prehispanic Mexico mulli (now know as mole) meant sauce, as does the Spanish word salsa. Over hundreds of years moles have come to include not only relatively simple sauces but an astoundingly baroque collection of fine sauces which may be served on steamed vegetables, poultry, pork and even beef, these versions generally being considered fiesta food. Unfortunately mole is widely misinterpreted, many people believing it to be a bad chocolate sauce. A mole may or may not include chocolate to balance its finely tuned flavors, but at no time should it ever taste like Hershey’s! 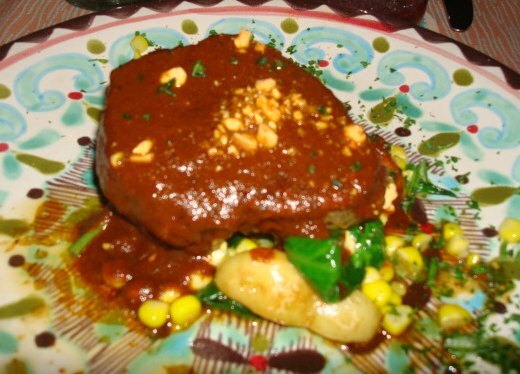 A mole might be light, fresh and herbal, and take under a hour to prepare, but it will warrant five stars… that’s mole. If you have the opportunity to try one, ask for a sample. If you love it, you’re in for a big treat, and if not–you’ve dodged that culinary bullet. A mole is only as good as the cook. The pipianes are fairly thick, textured salsas based on toasted pumpkin seeds and other nuts and seeds, giving them a rustic texture and nutty, creamy flavor. They may be served thick to enrobe meats or vegetables, or may be thinned with flavorful stock and served as a festive soup. Pipian may be red or green, depending on whether red tomatoes or green tomatillos are used as a base. There are myriad recipes and techniques used in the preparation of these magical sauces which are the heart and soul of traditional Mexican cooking. I would like to include a highly simplified run-down, the steps of salsa as I present them to cooks in my my kitchen. Simply chop or dice fresh, ripe Roma tomatoes, white onion, and serrano chile, fold them together, season with sea salt to taste and add freshly chopped cilantro, if desired, at the moment it is served and you have a fresh Salsa Mexicana or Salsa Cruda. Add chopped or diced red radish and some peeled, seeded diced cucumber and voila! You have Pico de Gallo! The original Pico de Gallo from Jalisco is made with equal proportions of peeled, diced jicama and peeled, diced sweet orange sections, sprinkled with toasted, ground dried chile. These delicate raw salsas, which are actually fresh relishes, salads or raw chutneys, are good for one day only. 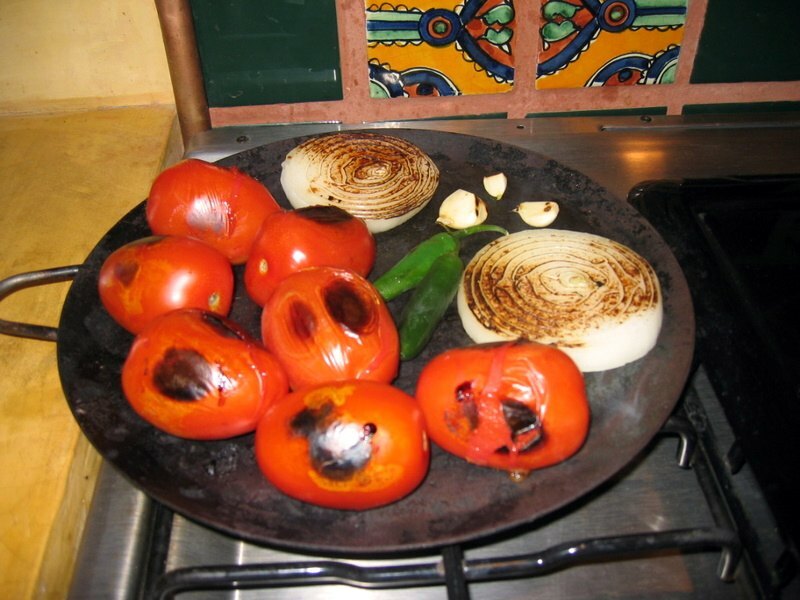 Char red Roma tomatoes or green tomatillos, a slice of white onion, a few cloves of garlic and a few serrano chiles on a hot, dry comal until everything chars, softens and sweetens. Grind in a stone molcajete or, as modern cooks do, in the good old Osterizer. If you use a blender, pulse and leave plenty of texture to mimic a salsa ground in a stone or earth bowl, season with sea salt to taste and you have what are known as salsas de molcajete, with their light, fresh, semi-cooked flavor and texture. If you puree your molcajete salsa (or the same ingredients raw, or simmered briefly in hot water until softened), you may then use a technique called “frying” a salsa. Heat a splash of oil in a deep soup pot, pour your red or green salsa directly onto the hot oil (be careful as it will splatter!) and “fry” until the head of foam that initially rises has fallen and the bubble are popping thick, about ten minutes. This thickened, “fried” version will have the lovely texture, concentrated flavor and color of a marinara. The red version makes a wonderful Salsa Ranchera. The next step would be to add a dried chile, or combination of dried chiles, to your red or green salsa. 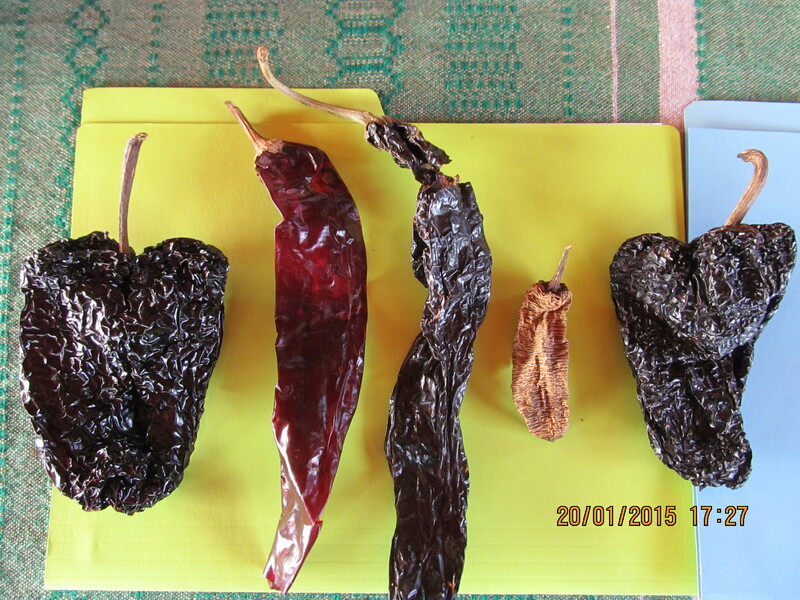 Toast your chosen chiles on a dry comal to maximize flavors, soak in boiling water to soften and add to instantly create a completely different salsa such as Salsa de Chile Ancho, Chile Guajillo, or Chile Pasilla (from left to right, below). Any of these salsas may be used in any number of dishes with widely varying and always delicious results. Although it is impossible to present a full discussion of salsas in such little time and space, I hope this gets you in the kitchen COOKING MEXICAN! A warm, dry greeting to all from Mexico City! A true tale of horror! I was spared the full trauma of the event as I breathlessly watched Odile’s progress through the window of my computer, high and dry with Manuel in Mexico City. 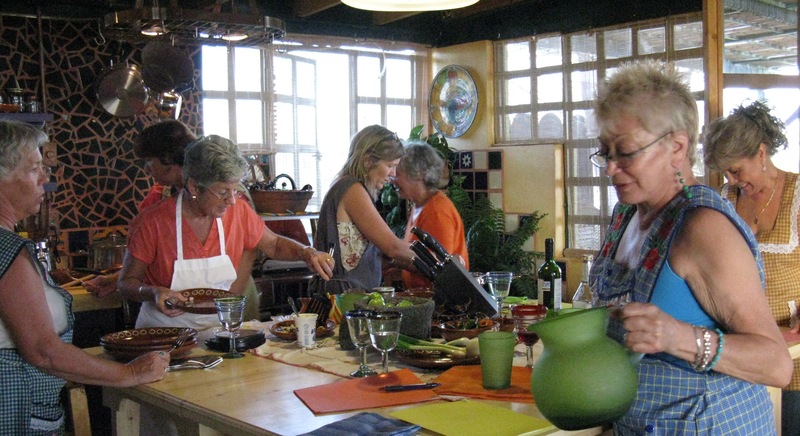 It would be days before I knew the extent of the damage to Baja Sur, and to my beautiful kitchen. I lost my second story roof to pressures equal to those of Florida’s Hurricane Andrew. I count myself lucky, because many hard working locals lost everything they own to what has been called the Odile Ordeal. Lots of concerned cooks who have adopted Cabo as their own community have contacted me to find out how I am, how Cabo is, and how they might help. There are many ways to support a disaster area, but I would say that without a doubt the most important thing people can do is to COME ON DOWN! Visit Cabo, and you are helping to rebuild in the most direct way possible. Will I be cooking? You bet! My first scheduled class, appropriately making Comfort Foods, will take place on October 17th. Luckily I have a spare beautiful kitchen, and my plan is to keep on cooking downstairs as repairs go on overhead. Considering the quality of the people who support me I don’t think it will be long before we are all cooking in my new and improved kitchen upstairs! Manuel and I have had wonderful adventures this summer visiting more of Mexico’s magical towns and cities. 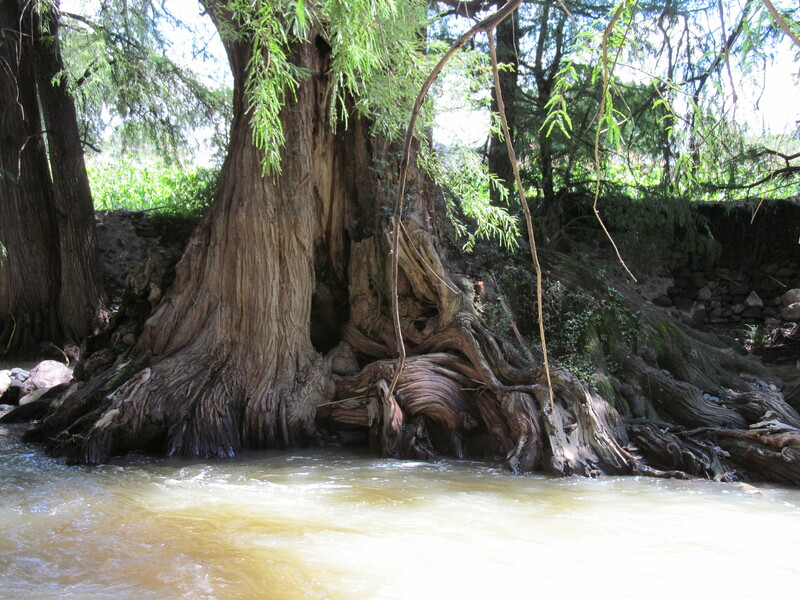 We spent a couple of weeks in Michoacán, which I have always been told is Mexico’s most beautiful state. It is indeed a very special place–the capital city of Morelia is a city of stone, perfectly proportioned architectural gems from the 16th century onward in all directions as far as the eye can see, centered around the fabulous iconic cathedral with its twin 70m towers… And the Lake Patzcuaro area of Day of the Dead fame is even more amazing than we had expected. I will reluctantly leave our travels to Michoacán, Puebla, Oaxaca, Tlaxcala and the Federal District for future articles, though I am posting like crazy on Trip Advisor to help travelers find their way to these incredible destinations. My warmest greetings and deepest thanks to all of you who have been in touch. Your communication has meant more to me than words can express, and I look forward to this season of cooking with you all like never before! 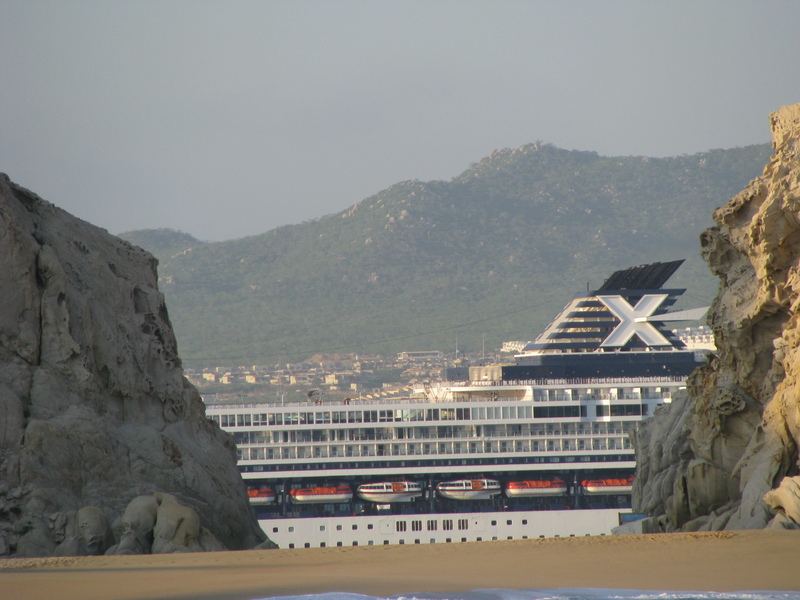 All reports from Cabo indicate that things have come together in record time to prepare for your visit. Manuel and I will be home on Sunday, lugging lots of wonderful freshly dried chiles and other goodies, ready to cook up a storm… in a good way, of course! Special credit to Manuel for today’s photo. Nice shot! It’s been far too long since I’ve gotten an article up. At the risk of cheating I want to post this great letter I received some time back from cooks who spend time every year in Cabo, who have access to a kitchen and continue to cook even though they’re technically on vacation. My people!! Just a note to thank you once again for the wonderful afternoon cooking in your home on November 22. We did a little shopping after class, and collected a few more ingredients. I was up early the following morning, toasting tomatoes, garlic, onions and peppers on our “comal” (a teflon skillet), grinding in our blender, then “frying” the resulting mixture to create our own version of Huevos Rancheros, which we served with the tortillas we bought with you–MMMMM! We also stopped at Artesanos later in the week, and I found a molcajete (I checked as you said, to determine that it was really made of stone). We seasoned it with many batches of guacamole during our remaining days in Cabo. During the course of or stay, we managed to accumulate little bits of leftovers to add to those you sent home. One of our last meals was a rendition of the soup we made, including the leftover broth, some rotisserie chicken (and broth made from that chicken), various odd veggies and some saffron rice. We licked our bowls clean! Did you know that you cannot bring a molcajete in your carry-on luggage??? That was our original plan–not wanting to pack it in a suitcase with a couple of bottles of tequila–but a sign at the airport listed the implement right along with guns, knives, baseball bats and more than 3 oz. liquid!. We had to do a quick re-arrange of the luggage contents before we could check the bag. I’m happy to report that it molcajete made it home intact, as did the tequila! We all concluded that attending your class was one of the highlights of our trip. I got some good ideas for use in my own classes during the upcoming winter, not only recipes, but techniques for building flavor. I really appreciated the background information you shared about the Mexican food culture–a key to understanding any community, I believe. Here’s hoping that our paths will cross again in Cabo–and don’t forget to include the Twin Cities on your book tour! Mexico City is too much! I know I’ll never see all the things I want to see in this sprawling megalopolis packed with life-loving Chilangos making the most of everything, every day. 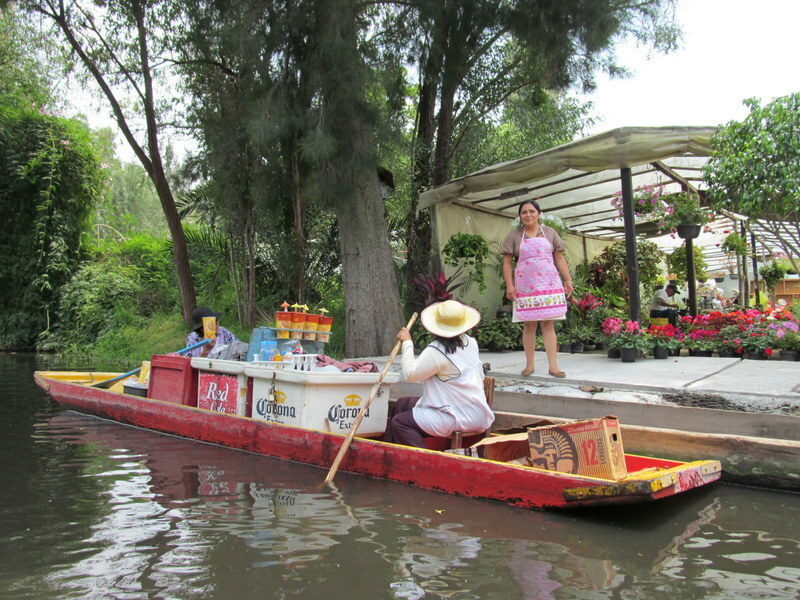 We were surprised to find a surreal dream of a Sunday filled with impossibly colorful gondolas, trajineras, bumping sides as they were poled through miles of canals that are the remnants of Lake Texcoco where the ancient Aztecs created fertile gardens to grow their foods and flowers. 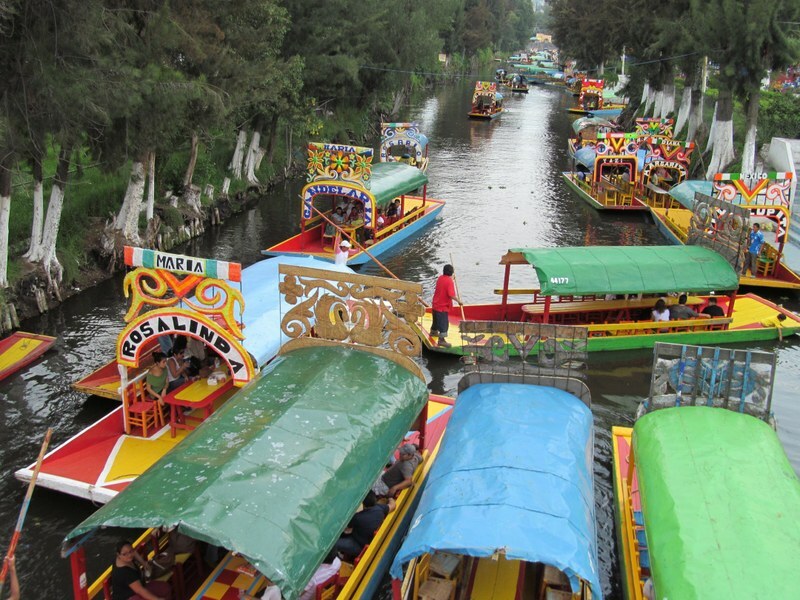 On weekends the canals become a floating fiesta with bars, restaurants and gangs of fully fledged mariachis all competing for business from their own colorful little boats. It’s a riot of color and sound, an olfactory and auditory banquet you really must experience if you have the good fortune to find yourself in this magical city. 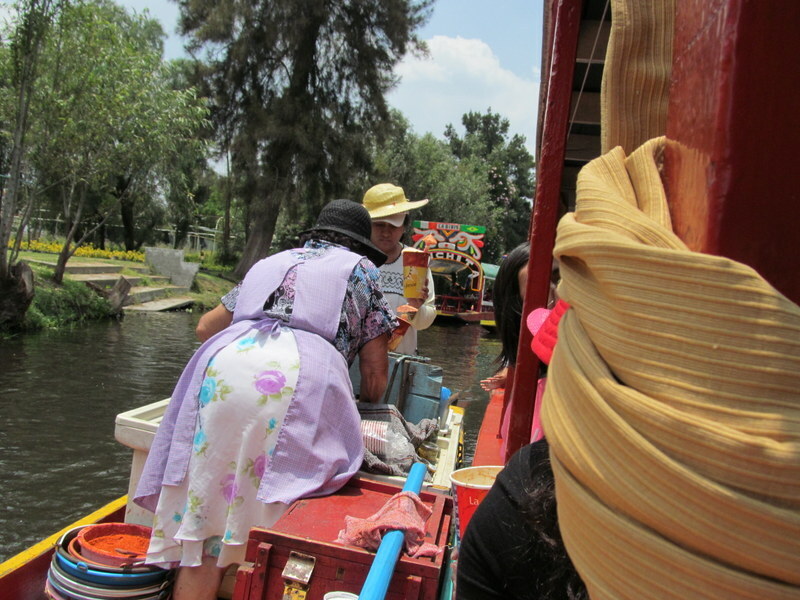 Xochimilco invites you to eat, drink and be merry! So flan it is for dessert, and if it’s well made, it rivals cheesecake as a finish and isn’t nearly as rich. It’s actually a stroke of dessert genius as it tops off a spicy Mexican meal like nothing else could. But about that sweet tooth. If you’re ever in a traditional Mexican market, or even a decent Mexican supermarket, take a look at the candy aisle. The selection above is pretty typical, candy for the eye as well as that aching tooth. So what’s behind all that day-glo display? Here’s a short list. Obleas con cajeta (Goat’s milk caramel wafers) – a delectable treat made of two paper-thin flour wafers filled with Mexico’s fabled goat’s milk caramel candy, cajeta, creating a sweet sandwich that won’t stick to your fingers. Also available as chewy caramel candies. Top brands: Coronado, Las Sevillanas (mini or medium) and Aldama. De La Rosa’s Mazapan (marzipan) – is a delicious and traditional peanut confection delicious with a tall glass of milk, or crumbled as a topping to enhance other desserts. Fruit rolls – These sweet fruity treats are very popular in Mexico, made from tropical fruits like coconut, mango and guava. Cocadas are deadly sweet coconut rolls. Popular brands include: Productos Cihuapilli and Dulces Moreliates. Spicy spoon suckers – Yep, it’s a spicy, salty, sweet and gooey candy sold right on a spoon in our favorite traditional tropical fruit flavors — tamarind and mango. Pepitorias (seed brittle) – This is a sweet and delicious confection made of ground sesame seeds sweetened with honey, coconut, pumpkin seeds and peanuts thrown in to guild the lily. Las Trojes is a popular brand that manufactures these succulent treats: Mixed seed brittle, coconut brittle, peanut brittle, sesame seed brittle and pumpkin seed brittle. Yum! Candy skulls – Celebrate the Day of the Dead and honor your departed loved ones with these crazy creative confections fashioned from sugar, chocolate or amaranth. 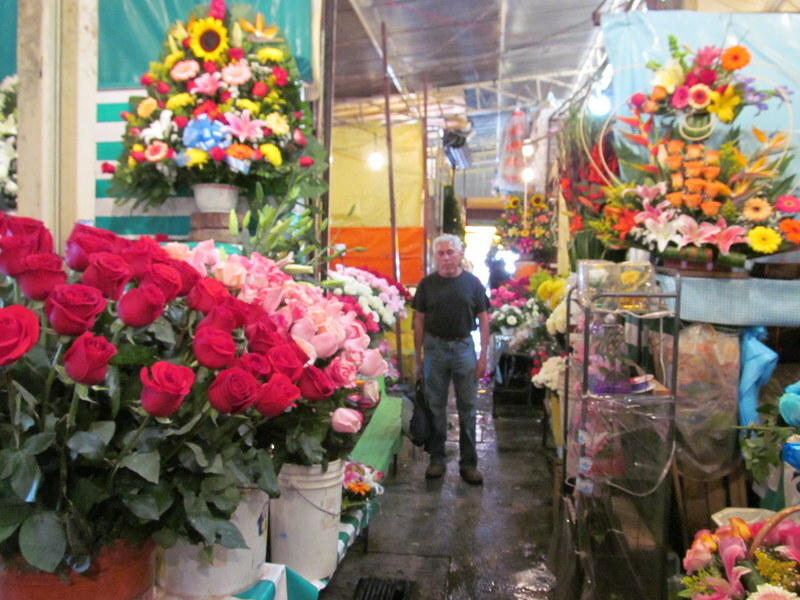 This much-loved Mexican tradition has been passed down through generations. …and this is a short list! 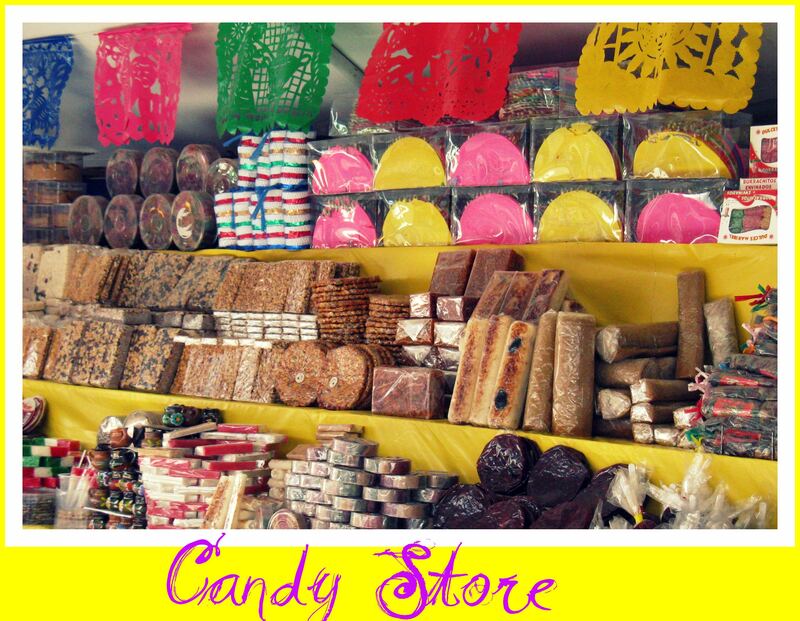 Take a tour through the candy aisle and start making your own sweet memories of Mexico! Every day people are taken by surprise in my kitchen when we toss the ingredients for a red or green salsa straight onto a hot, dry comal. Zero fat. What the heck is a comal, anyway?Well… it’s Aztec cookware. The name comes from the Nahuatl word comalli–the ancient Aztec language still spoken as a first language by many Mexicans, including a number of our Cabo beach vendors. Anytime you see all those x’s and tl’s in our Mexican Spanish (as in nixtamal and Tlaxcala) you are looking into Mexico’s past which, like so much of our traditional foods, merges with the present. 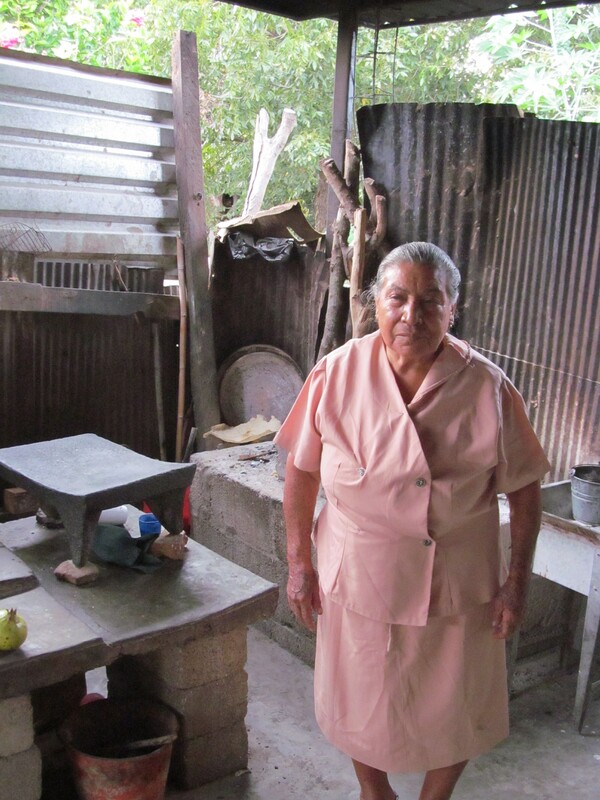 A comal is a griddle, traditionally made of thin, unglazed pottery. Modern cooks tend to use a more resilient heavy tin or rustic metal disc that can be scraped down with a metal spatula, and even scrubbed with a pumice stone since dry cooking thrashes a pan’s surface. Nowadays we’re seeing fancy comales in fancy supermarkets that are lightweight and have Teflon surfaces. Don’t buy them. You really want something you can abuse, and you really cannot scrub your Teflon with a pumice stone. Why go to all this trouble? Because, to quote the immortal Homer Simpson, Fire makes it good! It’s like when you do a roast, and the best of it is stuck to the bottom of the pan. Dry grilling or toasting ingredients on a hot comal builds layers of flavor like no other process can. And nothing gets peeled but the garlic because the best of the flavor is in the charred skins of those chiles and tomatoes. Dried chiles must be toasted before they are used in a dish. They are stemmed, seeded and flattened and pressed onto the hot surface of the comal until their heavenly toasted chile flavor is released. And they taste like they smell–you’ll never get that kind of flavor from chile powder! Other whole spices, seeds and nuts are similarly treated before they are ground and incorporated into traditional dishes including moles. The kitchen smells like heaven! Someone really should come up with a line of comal air fresheners! 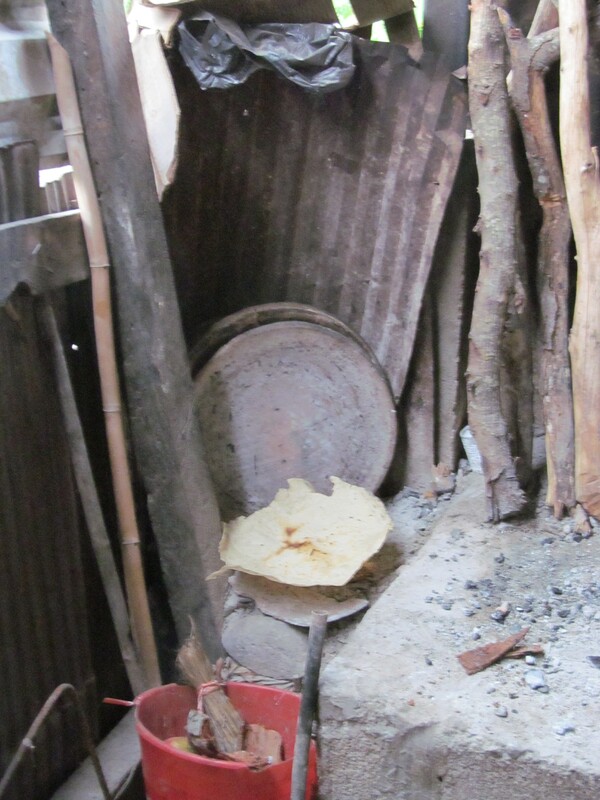 The comal is not the only Aztec cookware still in use today. We use a variety of ollas and cazuelas, glazed and unglazed earthenware pots that country cooks swear improves the flavor of a dish. They must be seasoned before use by simmering a chopped white onion and a head of garlic until almost dry. 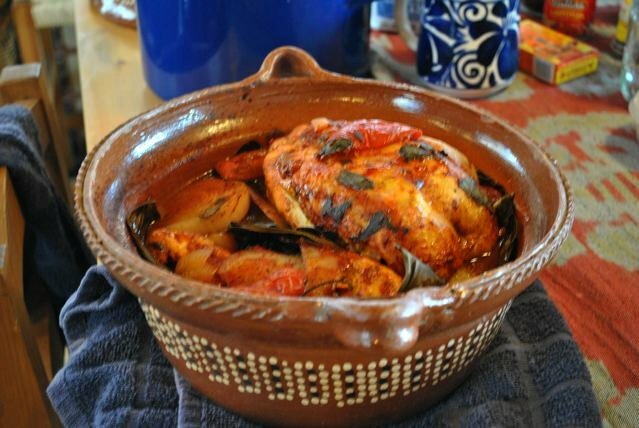 The practical piece in the picture goes, with its cargo of pollo pibil marinated and wrapped in fresh banana leaves, straight into the oven until the meat is falling apart in the sauce. Then, banana leaves removed and meat shredded into the sauce, it goes right onto a gas burner to simmer until the sauce has thickened for tasty pulled chicken pibil sandwiches… and the pot cleans up like nonstick! We still use the molcajete, that beautiful three legged volcanic stone bowl with its ergonomic handpiece, the tejolote, to grind salsas like the one grilling on the comal above. You have to be careful when you buy one these days since they’re now making chintzy bowls out of aggregate as garden ornaments. Scrape it with a key or coin, and if a lot of dust results, pass it by. Look for a real stone bowl that is not too porous. When you get it home it must be prepared by repeatedly grinding dry rice until the rice remains white with no gray grit to ruin your guests’ dental work… Don’t use soap on your molcajete, or your salsa will taste like soap forever after. Use hot water and lime juice, scrub well with a stiff brush, rinse with hot water, air dry and you’re good to go. As with earthenware comales and ollas, the stone bowl of your molcajete imparts an earth flavor to salsas that are considered to be an ingredient in traditional Mexican cooking. 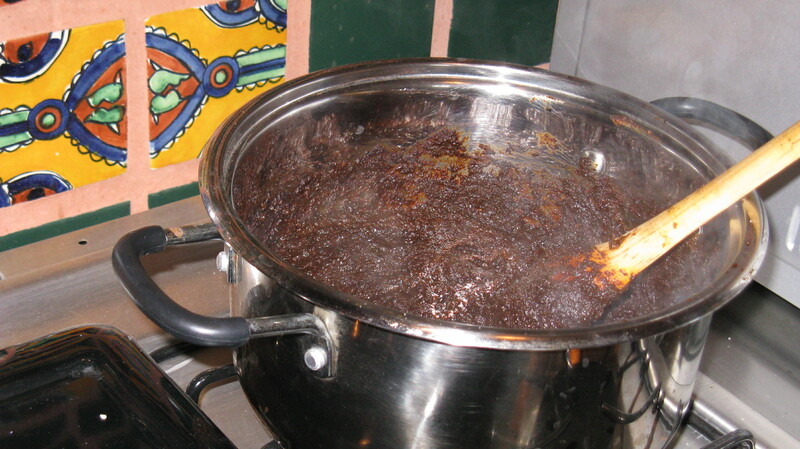 If you’re in a hurry or in a lazy mood, do what modern Mexican cooks do–pulse your comal roasted salsa in the blender leaving plenty of texture, and serve it in the molcajete to take advantage of its unique flavor. Don’t miss out on the flavors of traditional Mexican cooking. For a small investment you can have a collection of Aztec cookware that will look beautiful and keep on cooking for many years, imparting your dishes with the true flavor of ancient Mexico.